For other uses, see Sheaf. Wheat sheaves near King's Somborne. Here the individual sheaves have been put together into a stook ("stooked") to dry. Traditional hand-reapers, using scythes and working as a team, cut a field of grain clockwise, starting from an outside edge and finishing in the middle. Scything leaves a windrow of cut stems to the left of the reaper and, if cut skillfully, leaves the seed heads more or less aligned. These are then picked up and tied into sheaves by the sheavers, who traditionally use other cut stems as ties. These sheavers, or a following team, then stand the sheaves up in stooks to dry. Three to eight sheaves make up each stook, which forms a self-supporting A-frame with the grain-heads meeting at the top. This keeps the grain well ventilated, and off the ground allowing it to dry and discouraging vermin. The drying sheaves are later either placed by hand or pitched onto a cart. The traditional sheaf pitchfork has a long wooden handle, two short tynes and a rounded back to make the placing of sheaves easy. 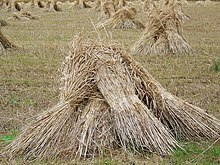 The gathered sheaves are then either built into stacks (thatched stacks could be over 20' high[better source needed]) or taken to a barn for further drying before being threshed to separate the grain from the stems. The mechanisation of agriculture in industrialised countries, in particular the introduction of the combine harvester from the middle of the 19th century, has made the sheaf redundant, but sheaves remain in widespread use wherever harvesting is still done by hand or by reaper-binder. In heraldry a wheat sheaf is called a garb. Omer (unit), a Biblical measure of volume of grain. This heraldry-related article is a stub. You can help Wikipedia by expanding it. This page was last edited on 7 March 2019, at 02:10 (UTC).